This picture is the perfect of example of perfect timing. Shot yesterday during the 100-meter World Championships final in Moscow, it shows the Jamaican sprinter crossing the finish line while lightning flashed in sky. Let's be honest: the only things I was able to control were the framing of the shot and when to hit the remote-controlled trigger. The flash of lightning -– well, of course that can’t be planned, even if the stormy sky had been rumbling for 20 minutes and all of us photographers were trying to capture a lightning bolt. This was, I think, a once-in-a-lifetime moment. In my 25 years as a photographer I’ve never had an uncontrollable external element make a photo like this, and I imagine if I tried again for a similar result for the next 50 years, it wouldn’t happen again. 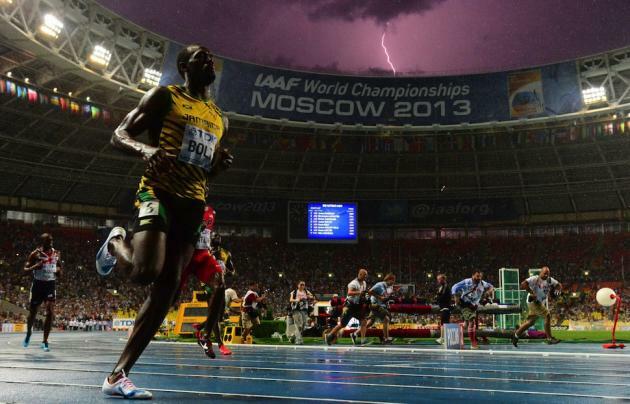 As for Bolt, he managed to regain the world title with an impressive time of 9.77 seconds in the 100 meters.